There's a hare in the air, there's a hound on the ground, and watching them both is shy Mousey Brown … And so begins an enchanting adventure, complete with danger, silliness, bravery and romance. Mouse is tiny but bold, Hound is vast and menacing, Hare doesn't have a clue and, between them, someone has to come out on top. Here’s another cover that I just love. One of the reasons I like it so much, is that it doesn’t give too much away about the story, but it makes me want to read it and find out what this hare hound and mouse get up to. The word rollicking gets used a lot, but there is no other word for this story, it is a rollicking good read. It is told in rhyme and it reads really well, as I have said in the past, if you were planning to read it to a group, read it through first. I love a good picture book love story, and that’s what we have here. Hare is so excited that Spring has sprung, and she is jumping around wanting to share her joy with everyone. Little Mousey Brown has a soft spot for the hare, but knows she would never look his way. 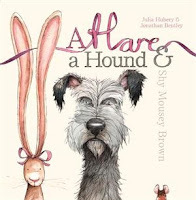 When hare starts to towards the hound, Mousey Brown starts to fret because he knows that the hound is not asleep at all…but waiting for the hare to get close enough to snap her up in his jaws! Mousey Brown is small, but he knows he must do something to save his love. Unfortunately his biggest loudest bellow of warning is not loud enough to warn the hare, so when the hound strikes Mousey Brown ‘leaps from his lair’ and manages to defeat the hound with, not a sword, but a feather! It is simple and beautiful and it just goes to show that true love does not discriminate when it comes to stature, heart is all that matters!